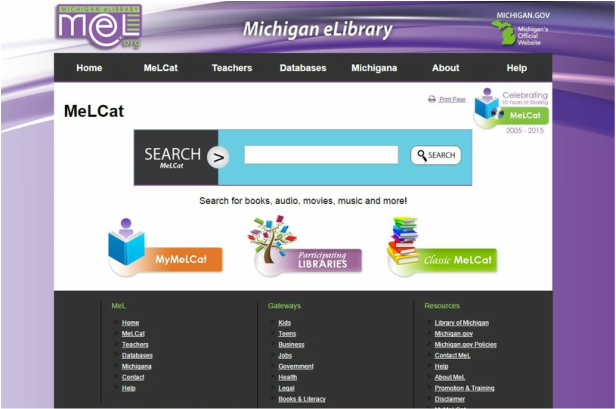 The Michigan eLibrary (MeL) is a free resource that provides Michigan residents with access to online articles, books, images, and other materials and research information at any time via the Internet. To learn more about the many services that MeL offers, watch a video to familiarize yourself with the MeL catalog or ask a librarian for assistance! Order books from other Michigan libraries and have them delivered directly to the library. All you need is a Lawton Public Library card! MeL offers homework help for kids, teens and college students as well as resources for teachers, such as lesson plan builders and online professional development training. Practice tests are available for students of all ages, including for students, including SAT and GED prep. Computer skills classes, US Citizenship courses and career exams are offered for adults. Classes taught in Spanish are also provided. Gain instant access to full-text articles about a variety of topics, including Law, Medicine, Genealogy, Business, Car Repair, Michigan History and many more.